HomeNew CarsNewsHyundai Reveals 2015 Sonata Hybrid! Hyundai India might launch the 2015 Sonata Hybrid (as the 2015 Sonata is coming next year) seeing its arch rival Toyota Camry Hybrid doing well in the country. And Indeed Toyota India says Hybrid Camry accounts for 75% of total sales of the sedan! 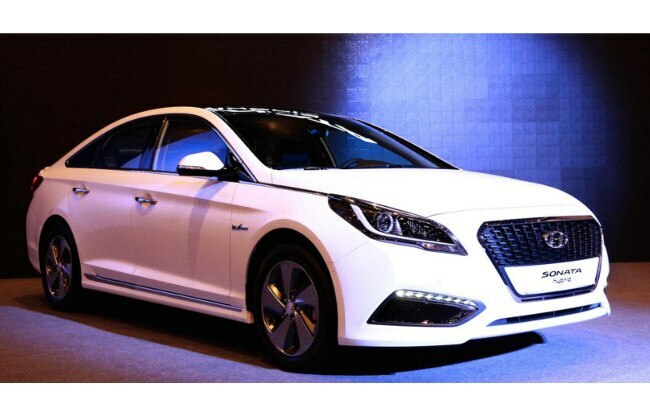 Hyundai has revealed the 2015 Sonata Hybrid in an event in Seoul yesterday. Comparing with the on-going Sonata Hybrid (not on sale in India), Hyundai says the 2015 Sonata Hybrid has improved marginally in almost every department from efficiency to performance. Moreover, the Korean automaker says, more info on the plug-in hybrid vehicle will be released at the 2015 North American International Auto Show, Detroit, U.S next month. “The launch of our all-new Sonata Hybrid, with its class-leading fuel economy and powerful driving performance, comes at a time when eco-friendly vehicles are becoming established as a mainstream car,” commented Mr. Jin Kwak, Hyundai Motor’s Executive Vice President. “Our latest offering, based on one of our best-selling models, underscores our efforts to meet the growing popularity of eco-friendly vehicles around the world,” he further added. The 2015 Sonata Hybrid is powered by a 2.0-liter GDI (Gas Direct Injection) petrol motor mustering 156 PS and peak torque of 189 Nm. The Electric motor on the other hand, hums 51 PS of max power and 205 Nm of torque. The coupled output presumably exceeds over 200 PS and torque close to 390 Nm. The powertrain is mated to six-speed automatic transmission to minimize energy loss. Speaking of the battery pack, the all-new Sonata Hybrid draws power from a lithium-polymer battery pack placed at the trunk floor with a capacity of 1.62 kilowatt-hour. The green vehicle delivers 18.2 kmpl riding on 16-inch radial while on 17-inch wheels, the overall fuel economy drops to 17.7 kmpl.